How is your life over there? I hope all is well with you,i am happy to recieve your mail , thanks for your responce to my mail . I am here again and i want you to know all about me,i am miss Fatu Kamara,the daughter of Dr& Mrs Jean Kamara From Sudan.i am now in refugee here in Senegal due to the death of my parents because of the war in my country in Sudan.In this Refugee camp we are only allowed to go out only on mondays and fridays of the weeks. Its just like one staying in the prison and i hope by God's grace you will help me to come out here soon. I don't have any relatives now whom i can go to, all my relatives ran away in the middle of the war.i will give all the informations which my late Father Dr. Jean Kamara used for depositing the money in the bank here in Dakar,Senegal.I want you to help me in transfering this money into your bank account because my parents was killed by the rebels in my country due to the war. As a refugee here i don't have any right or privilledge to any thing be it money or whatever because it is against the laws of this country (Senegal).I want to go back to my studies because i only attended my first year as a law student before the traggic incident that lead to my being in this situation now took place. Please listen to this, i will give you all of my late father's Fund deposit documents, because when he was alive he deposited some amount of money in a leading bank here in Senegal, which he used my name as the next of kin, the amount in question is $5.7M (Five Million and Seven Hundred Thousand Dollars). So, i will like you to help me transfer this money to your account and from it you will send some money for me to get my travelling documents and air ticket to come over to meet with you. I kept this secret to people in the camp here the only person that knows about it now is you because i trust you that you will be of assistance to me. So, in the light of above i will like you to keep it to yourself and don't relate it to anyone for i am afraid of loosing my life and the money if people gets to know about it. Remember i am giving you all this information due to the trust i deposed on you. I like honest and understanding people, truthful and person of vision, truth and hardworking person. The money in question was made by my late father through his oil & Gold business and his political career, that is why i don't want anyone here to know about it until i travel out from here. Honey, i believe that this our relationship is the direction of God, please i want you to have the same mind and faith to help me out, i am here once more because my situations here is very bad coupled here in Senegal cost of things is very expensive,to eat food or take care of my self as a young girl is a very big problem to me.Now, i have seen that you really wants to help me out from my situations here in the camp,i am giviing you the whole informations about my father and the money.Darling,do not expose this money to people because it is my life and when people knows that this amount of money is coming into your bank account,all eyes will be on us,i will not like to die young plz. I explained all about me to you with breaking heart, faith and trust which i believe that you will not let me down, please handle this matter as yours till the successfull end meanwhile i want you to contact the Bank and demand for the transfer of the money into your Bank account, do not open this matter to people over there, just hold it between you and me for security purpose , you are the only one i told about this fund and i will like you to keep it secret to others because hence it is MONEY all eyes will like to be on it which may put our life in danger, i hope you understood me? 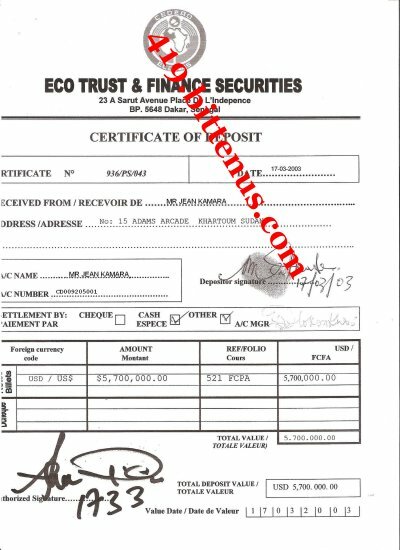 i have given you some of the document related to the deposited fund and, so feel free to help me out. Darling, i am always happy with your efforts towards my situations here in the refugee , i kiss and hug you with my love. Hearing from your voice now is my happiness, i am missing you and the almighty is going to guide and bless you for all your efforts towards me.i am happy with you interest in Education, Darling,You will search for a very nice business of your choice where this money will be invested. Darling,the suffering here in the camp is too hard for me, could you imagin that i have not tested any thing like food since yesterday's afternoon, to eat food, water or even taking care of myself is a problem to me,the almighty is going to bless you as you promised sending money to me, i am promising to be your wife and you will be the Father of our children in Future. Darling, use this informations to send the money through the Western Union Money Transfer. Address No. 12/18 Yoff Layenne,Yoff. Honey,as soon as you send the money,try to send the informations you used for sending the money to me,i will be in the Rev's office to wait for your call. i am missing you. i kiss and hug you with my love. Hope all is with you,if so thanks be to the almighty Father, i am missing you and my happiness is all your efforts towards me, i am missing you and hoping to be with you as soon as this money is transfered into your bank account.i am now waiting to hear from you on what you will discuss with the Bank, when i was in the bank yesterday,the bank manager promised me that as soon as the bank hear from you. they will not be delayed to transfer the money into your bank account. The almighty is going to guide and bless you for your concerns, i was rushed to our camp yesterday because i was shocked after reading from your mail,the contents of your mail made me to remmember my late parents, i love you and i want to join you as soon as this money is transfered into your bank account. Try,to write to the bank,tell them that i am the person that directed you to them, you wants to know the possibilities of transfering my Late Father's (Dr Jean Kamara) deposited $5.7m into your bank account in our country Sudan, You know that i have already submitted an application to the bank with your name as my trustee to the money, the bank manager,Mr. Nik Domo promised to transfer the money into your bank account as soon as the bank hears from you. My happiness is that you are sending money to me for my buying food and drugs,the almighty will bless you. try to send the money through this my information from the Western Union Money Transfer. try to send the informations to me plz. i am missing you, i kiss and hug you with my love. We have received application from Ms. Fatu Kamara, a refugee registered with the UNHCR Dakar office, with regards to the claim of her inheritance with our bank worth $5.7m. Her application was approved by the bank Management and she received an instruction to appoint a fund trustee who will sign the fund release order and receive the fund on her behalf for investment purposes. 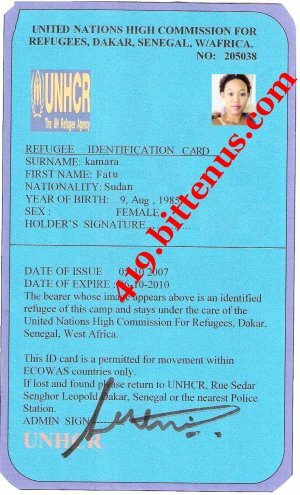 We wish to remark that her status as a registered refugee with the United Nations High Commission for Refugees Dakar Office makes it illegal for the bank to release the money directly to her without the involvement of a legal trustee who will deal with the bank on her behalf and receive the fund for investment . We will open a file in you name for the transaction as soon as you provide us with the following requirements viz: -Copy of a trustee mandate issued in your name in a court in Senegal authorizing us to recognize you as her appointed fund trustee, and therefore deal with you on the fund release and transfer. -Copy of the photo-page of your international passport or any valid identity you have for bank use.-Your nominated trustee account details. Be advised to consult an accredited Senegalese lawyer to assist you in processing the trustee mandate in the High Court of Senegalese according our specifications in matters of this nature. As soon as we have the above stated details and the legal trustee document , our Management will approve release and transfer of the fund to your custody as fund trustee accordingly. Be guided accordingly and revert to the Credit Transfer Manager Mr.Nik Domo on direct tel/fax numbers for clarifications if need be. The Credit Lyonnais Bank Of Senegal. 361 Bd Djily Mbaye X Rue Huart BP 560 MEDINA The Credit Lyonnais Bank is a Senegalise Bank and its products are available to Senegalais and foreigners,subject to any restrictions laid down by Senegalais law).The Credit Lyonnais Bank is authorised and regulated by the (BCEAO)Financial Services Authority (No. 121885), subscribes to the Banking Code, is a member of the Financial Ombudsman Service and is licensed by the Office of Fair Trading (No. 006110). This e-mail is sent by a Credit Lyonnais Bank and may contain information that is privileged or confidential. Subject: Darling,i will welcome you at the airport. Hope all is well with you and the entire members of your family? i am happy to see the mail from the bank, i now understand that we needed a Lawyer that will help us to get the trustee mandate with your name from the high court.The Rev. has promised to help me to get a Lawyer here in Senegal that will help us to get the trustee mandate with your name from the high court with your name as my trustee to the money. Darling,i am also happy as you promised to come and see me here, i will be in the bank on Monday to inform the bank manager for your coming, i am happy for your coming because i will also be at the airport to welcome you and you will follow me to the bank where the money was deposited. Honey, i am waiting for the money you promised me for my feeding and my drugs because here in the camp is hard for me. i am missing you you and also waiting to hear from you soon,try to send the money to me through the Western Union Money Transfer,you should send the informations to me because i will use the informations to collect the money. i am missing you and the almighty is going to guide and bless you for your efforts. i will be witing for the money tomorrow,i am happy because you will come here soon and i will be in the bank on Monday about your coming. What i mean by kiss and hug is for love. i am here once more because reading from your mails is my happiness here in the camp,the almighty is going to bless you for your efforts towards me. i will be happy to see you here and you will follow me to the bank where the money was deposited by my late Father. Today is Saturday, i am hoping for your promise tomorrow being Sunday and also i will be in the bank on Monday to inform the bank manager here in Senegal about your coming.i am missing you. my condition here is not ok but i will join you soon hence the money is transfered into your bank account. Send the money through the Western Union Money Transfer from this my informations. Address...................No. 12/18 Yoff Layenne, Yoff. Darling as soon as you send the Western Union Money Transfer, try to call the Rev. to inform me and you should send the informations because i will use the informations to collect the money from the Western Union Office plz. i am missing you,the almighty must bless you for your kindness, i am still waiting the day you will be here with me as you promised, i will be in the bank tomorrow to inform the bank manager that you are coming here, i promise to be at the airport to welcome you. About my real name. (1)Miss Fatu Ami Jean Kamara. (2) you will see my id card attached(3) No. 12/18 Yoff Layenne,Yoff, Dakar,Senegal. Darling,you should send the money to me through the Western Union Money Transfer. i am thinking of you always,the almighty will bring us togather soon,i am missing you,i kiss and hug you with my love.